William H. Bonney, known as Billy the Kid, was the youngest and most famous example of a gun-fighter from the American West. His legend survived and grew long after his death. On November 23, 1859, Henry McCarty was born in New York City but moved to Kansas with his family when he was very young. His father died soon after the move and his mother remarried and moved west to New Mexico. Henry took his stepfather's name, Antrim, and eventually changed his name to William H. Bonney. There are very few facts about Bonney's career that can be verified. His problems with the law began at age fifteen, when he was thrown in jail for theft in Silver City, New Mexico. After escaping to Arizona, he shot and killed an older man who had bullied him into a fight. Bonney then fled back to New Mexico. Back in New Mexico, Bonney became involved in the Lincoln County War (1878–79), a violent struggle between rival groups of cattle ranchers and merchants. He proved to be a fearless fighter and an excellent shot. However, two of those shots ended up killing Sheriff James Brady and a deputy. As a result, Bonney was wanted for murder. "His equal for sheer inborn savagery," wrote journalist Emerson Hough, "has never lived." 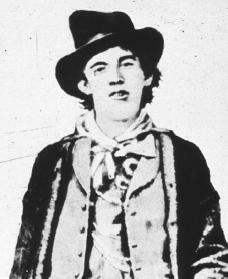 Such statements sent Bonney's reputation soaring and won him the nickname Billy the Kid. Billy struck a deal with Territorial Governor Lew Wallace. He agreed to testify against other murderers in return for having the charges against him dropped. However, after gaining his freedom, Billy returned to his criminal ways. He led several other men in stealing cattle from some Texas ranchers. Wallace then ordered him arrested. Sheriff Pat Garrett soon took the Kid into custody. A judge told Billy that "You are sentenced to be hanged by the neck until you are dead, dead, dead!" Billy the Kid's reply was "And you can go to hell, hell, hell!" Billy the Kid was somehow able to overpower and kill his jail guard, shoot another deputy, and escape. This time the lawmen would take no chances. In July 1881 Sheriff Garrett and his posse (a group of men organized by the sheriff to assist him) trapped Billy at a house in Fort Sumner, New Mexico. They ambushed him in a dark room and shot him to death. The next day he was buried in a borrowed white shirt that was too large for his slim body. Admirers scraped together $208 for a gravestone, which was later broken into pieces and stolen by souvenir hunters. Billy had lived exactly twenty-one years, seven months, and twenty-one days. the facts. For example, he did not kill twenty-one people; he killed four men and participated in the killing of several others. Far worse than the inaccuracy of the stories were their attempts to make a hero out of a thief and murderer. Cline, Donald. Alias Billy the Kid: The Man Behind the Legend. Santa Fe, NM: Sunstone Press, 1986. Utley, Robert M. Billy the Kid: A Short and Violent Life. Lincoln: University of Nebraska Press, 1989. The Kid was my hero, I always liked his movies and history portraid about his shooting. I have read quite a few accounts of William Bonney, and although none of them perfectly match i have come to the conclusion that the actual proofs of any facts are very few, there are what they say are facts that Billy may have killed four men two of them being a sheriff and a deputy, who is alleged to have been controlled by the alleged territorial boss of Lincoln county. The story being that Billy had stolen some Cheese because he was hungry is a story that could be told of millions of youngsters, especially among those who are to proud to beg. Also it is only speculation that Billy run with the Gang stealing Chisholm cattle, and even if true it could have only been for a very short time, as from the time the conflict started in 1876 to the time Pat Garrett was elected sheriff was four years, where would billy have had time to do all of the stuff he was accused of when the war lasted during most of his known history? Also, no evidence that Billy was the leader of anything, his friends say that he was easy going, easy to get along with but good with a gun. I have also noticed that the only picture of him to my knowledge show him carrying a rifle not a six shooter. To sum this up at least in my mind is that Billy along with just a very few others were the only one that stuck with their employer, Tunstal after he was murdered by the Jessie Evans gang who were deputized by sheriff Brady. Was Billy the kid an outlaw, well i think any man will be called an outlaw by some people depending on which side of any disagreement they happen to be on, in this case the Murphy- Dolan factor happen to have control of both the political and the economic sides of the issue. Billy Bonney refused to let the issue be dropped because he thought that Murphy and Dolan should pay for the murder of John Tunstal so he was declared an out law. Billy the Kid was given a big reputation by pat Garrett for the purpose of Glorifying himself. yeah right, Billy the Kid was the greatest gunman that ever lived, but i beat him. Most of the story of the Lincoln county war is pretty much how most western movies start out, first the big man of the town who will do any thing to keep his monopoly, including murder. The only odd ones in the story here are John Chisum, and Pat Garrett, Chisum who was on the same side as Tunstall but did not get involved in any of the battle and Garrett who was not involved untill after it was all over and went after Billy the Kid. Billy the kid being one of the few decent ones in the whole dammed story. His name was William H Bonney and he was born in Missouri in 1855. Book available at E-Book Time.com and Amazon.